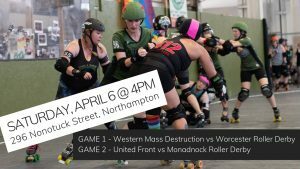 Pioneer Valley Roller Derby kicks off its 13th season with a double header featuring the Western Mass Destruction and the United Front. Doors open at 3pm, with the first game whistle at 4pm. Get there early and bring a chair/blanket to sit right by the action! Join us for the afterparty at The Quarters in Hadley after the games!